Notre Dame-Fairfield guard drives to the basket against Kolbe Cathedral's Calvin Wade in the Lancers' 69-61 win over the Cougars on Saturday night at Harvey Hubbell Gymnasium in Bridgeport. The Notre Dame-Fairfield boys basketball team completed its regular-season sweep of Southwest Conference rival Kolbe Cathedral with a 69-61 win Saturday at the University of Bridgeport's Harvey Hubbell Gymnasium. The Lancers improved their record to 10-1 and snapped Kolbe Cathedral's five-game winning streak. The Cougars fell to 6-3. Marcus Ortiz led the Lancers with 22 points, including three 3-pointers. Ortiz scored 19 of his points in the first half before the Cougars managed to slow him down by switching to a zone. Tre McPherson added 17 points, aided by a 9-12 night on the free-throw line. "Ortiz was on fire in the first half," said Kolbe Cathedral head coach Chris Smith. "The first game (played in December), it was Tre. They have some good guards and some good shooters, their big men outplayed ours tonight." Ortiz said that even though he was the high scorer, he's far from being the star on the team. He said that any game, any player on the Lancers roster has the ability to lead the team to victory. "Anyone on our team can step up any night," Ortiz said. "We don't have any stars and there's no selfishness on the court. We play with the same goal, and that's to win." Ortiz said that when he was shut down in the second half, center Arkel Miles was a dominant force for Notre Dame. Miles added 11 points, and also had 14 rebounds, 10 of which were offensive. 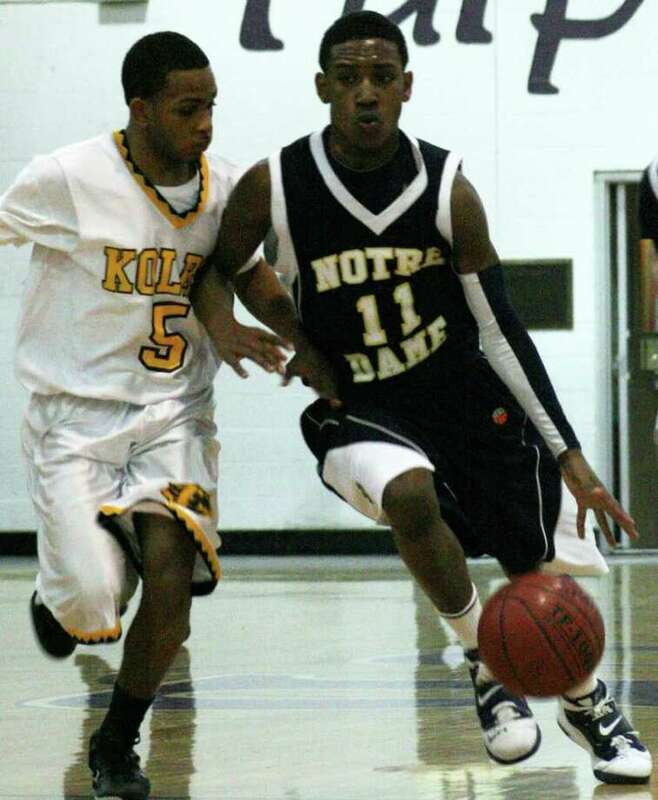 He out-dueled former AAU teammate Shaq Thomas, and held the Kolbe Cathedral center scoreless. "It became personal on the court," Miles said. "We'd go up against each other in practice all the time, so I knew what to expect from him." Even though Kolbe Cathedral cut Notre Dame's 22-15 first quarter lead to 38-36 at the half, Smith said he felt the Lancers controlled the game. rebound and put it back in," Smith said. "They got the loose balls, they made their foul shots and we didn't. (They did) a lot of little things." Kolbe Cathedral's D.J. Perry led all scorers with 26 points. Calvin Wade had 12 for the Cougars, and Troy Owens and Losrick McDonald both had 11. Kolbe Cathedral guard Robert Pinnock tied the game up at 40 when he made the front end on a one-and-one with 5:18 left in the third quarter. But the Lancers went on a 6-0 run that allowed them to put the game away. Miles hit a free throw, McPherson hit a layup, Miles put back a miss by Earl Coleman, and McPherson hit from inside to give Notre Dame a 46-40 lead. "They beat us by 15 the first time, so this was a good game," Smith said. "Notre Dame played well, they got good guard play, and their big man got the rebounds and and-ones when they needed them. We've got to get a little tougher inside." Kolbe Cathedral made just 16-31.